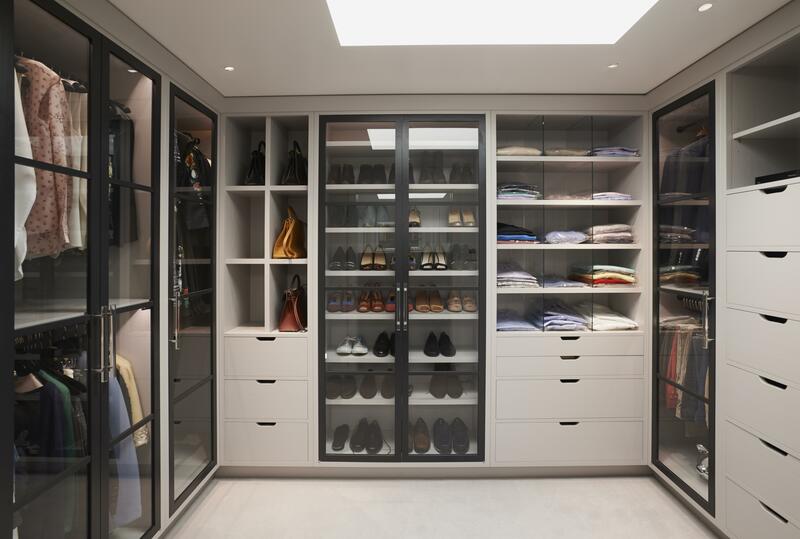 What are the advantages of bespoke dressing rooms? One of the main advantages of having a dressing room is the space that it provides, allowing you to have your clothes, shoes and accessories in a dedicated area rather than trying to contain all of these within a bedroom. This also means that by having a specific room for these items the bedroom can remain decluttered, so that the room can become a more calming space. Having a dedicated dressing room generally affords you a greater amount of storage so that every item has its place allowing the client to be more organised. Also, as the room’s sole purpose is that of being a dressing room you can tailor the room specifically for the individual or couple using it. Certainly having a dressing room can provide a sense of luxury, and for us as designers it can provide us with the opportunity to be very creative with the layout and tailor it personally to the client’s needs. Is it a good idea to share one or should you have one to yourself? This really comes down to a question of space. In an ideal world most clients want to have their own but this isn’t always possible. If the clients are able to have one each then we can tailor it to meet their individual needs. This can then lead to these rooms being the most personal spaces in the home, tailoring the furniture and finishes to the individual. We can keep similar themes across both dressing rooms but having your own one does allow for more self- expression which you may not have in the more sociable, open rooms in the home. Individuals will also differ in terms of how they like their clothing and accessories to be displayed which can ultimately lead to very different designs between the two dressing rooms. The beauty of having two dressing rooms is that each layout can be designed without compromise. How should we go about arranging clothes? Every client is different, and we would ask a fair few questions to ascertain how they would like to store their clothes and accessories, how they would like to use the space, which items do they need require regular access to, which items will potentially be stored. And then from this the questions may relate to aspects such as do they need lots of hanging, would they prefer more shelving, what height do they want their hanging rails to be, do they want fixed shelves for shoes or have them hidden away? Some clients prefer to have their clothes arranged by colour others style or purpose, so once we understand this, we can help with the solution that meets their requirements. Can you design a wardrobe for someone with lots of clothes but no idea how to store them properly? Yes! Firstly we need to have an understanding of the range of clothes and accessories that they want to be storing in the dressing room. The key element with this type of client is to allow a versatility with the storage such as adjustable shelving, so that they can rearrange their storage if necessary creating different apertures, moving hanging rails and so on. We are having a number of clients requesting more glass fronted drawers, but that may come down to how tidy and organised you are, which is also relevant when it comes to deciding whether to have doors on the overall wardrobes themselves or to keep them open. How can you create the maximum storage out of a limited space? By working with a bespoke furniture company such as McCarron & Co it means that we can utilise every millimetre available in the room and also the style of the furniture will have an impact on how the storage works. 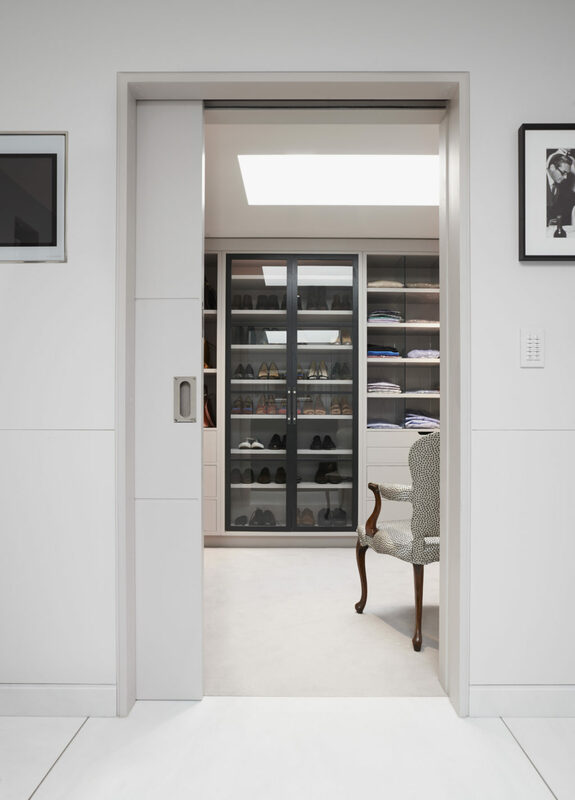 It is very important to consider the depth of the wardrobes as consideration needs to be made for wider garments such as jackets and suits that require more internal space so that doors shut without touching the clothing. For one client recently we transformed a partition wall into a stunning floor to ceiling wardrobe which included a secret door through to the en-suite. This provided the maximum storage space available in a very stylish manner. Clever lighting and the use of mirrors should be considered very carefully in these spaces to maximum the space and light. What materials do you use for dressing room storage? With a bespoke solution the client can almost have any material they desire, however painted exteriors are still very popular. Sometimes it is better to use a lighter wood such as maple or oak internally. And some clients like to include an element of cedar as this is reputed to keep the moths at bay. If the client wishes for us to include a dedicated drawer for jewellery or watches then they may wish to line it with a different material such as leather or suede. As this room is so individual we can use glass, mirror, leather and fabrics to personalise the space. If you want to discuss your bespoke dressing rooms idea with Andy then he can be reached on 020 7584 5736 or at our McCarron & Co showroom at 84 Fulham Road.